The NEW CaptiFi / Repeater kit allows you to connect to a distant wireless network/access point, and rebroadcast your own private wifi network into your home, RV, or boat. Setup is a breeze, and the performance is world-class! Works on ALL operating systems, even cell phones, tablets.. anything wifi enabled! The WiJacker USB Wifi Router Repeater, combined with our popular CaptiFi USB Antenna, is the wifi solution you have been waiting for! Instantly and seamlessly capture any public WiFi network and make it your own personal wireless access point! No need for any additional equipment! No software required. Easily configurable via web interface. Heavy duty anodized aluminum construction for CaptiFi and USB WiFi Router Repeater. CaptiFi is weatherproof. 802.11B/G/N standard WiFi on Router/Repeater, 802.11 B/G/N CaptiFi antenna. Operates as a standard high power access point or Heavy duty travel router. 12V operation for connection to power adapter, or any 12 volt mobile outlet. Share long range wifi connections with multiple computers! RadioLabs is proud to introduce the simplest kit available to repeat any WiFi signal, turning a public hotspot into your own private wireless network. Sets up in minutes. There's simply nothing like it on the market. 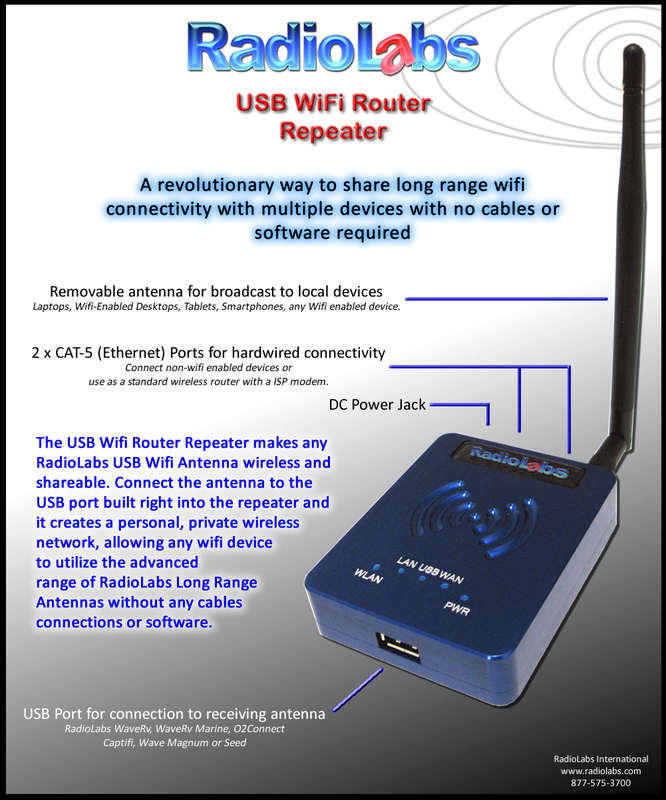 Interested in trying our best selling USB WiFi Router Repeater, but don’t know where to start? Well now, RadioLabs has brought our two premiere products together into one kit. The CaptiFi USB Antenna has proven to be the most reliable and compact marine antenna, and pairing it with our USB WiFi Router Repeater allows anyone to set up their own personal hotspot. Plug in the CaptiFi antenna to the USB Repeater. Locate and Capture the desired public or private WiFi signal. Name SSID of your own personal Access Point ex: "Bobs House"
Surf the web on your own 100% independent network! 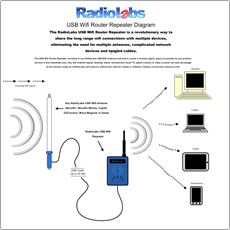 The USB Router Repeater works by bringing in distant wireless signals through a USB antenna, then re-broadcasting those signals so local devices can connect. This allows phones, tablets, laptops, and virtually any other WiFi enabled device to receive a strong and consistent signal without having to each have their own powerful antenna. The CaptiFi USB Antenna has stood the test of time and strength by being one of our most reliable weatherproof antennas. It can stand up to frozen rain, broiling sun, high winds and still be a highly reliable long distance wireless solution. At distances of up to 1 mile, the CaptiFi outperforms most any standard consumer wireless card. The CaptiFi uses a 1 inch standard threaded marine base, making it simple to attach to any boat or RV. The 15 foot attached cable then plugs directly into the USB Router Repeater and with simple set up through the installed firmware, repeat any signal as your own personal, private WiFi gateway. There are no software or drivers required to setup and use the USB Router Repeater, just a computer with a standard web browser installed. The Easy Setup configuration tool connects the USB Router Repeater to an access point, then allows you to set security and a personalized name for your hotspot. Adjustable up to 1 Watt. -- Max Legal FCC output -- w/Captifi antenna installed. Dimensions 3.5" x 3" x .75"